This piece originally appeared on Domainehome.com. We love the soothing clarity of an all-white interior as much as the next person, but there's something undeniably exciting about a room that goes a little wild with its design. To help us all transition from the snowy palettes of winter to something fresh for spring, we took the time to revisit some of our favorite color-splashed homes. These living rooms prove color can appeal to a whole variety of personal styles, and should be just the inspiration for anyone looking to up the fun factor just a bit. Designer María de la Osa's Spanish home is fearless in its mix of patterns, color, and style. 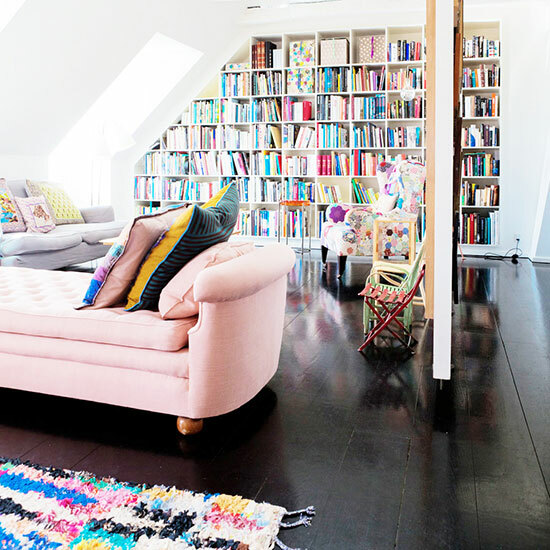 Dark hardwood flooring grounds the colorful whimsy of a pink sofa and technicolor boucherouite rugs. Bold, contrasting colors, pop art, and mod furniture lend this living room an upbeat liveliness. White walls provide the perfect palette for strikingly colorful art and poppy patterns. This living room approaches color with a softness that renders the design peaceful, rather than loud.